This Freestanding Floor Mount Chrome Metal Lever Handle Clawfoot Tub Filler Faucet Package 1002T1FSP is sold complete and is fully ready to install with your Clawfoot or Freestanding Bathtub. 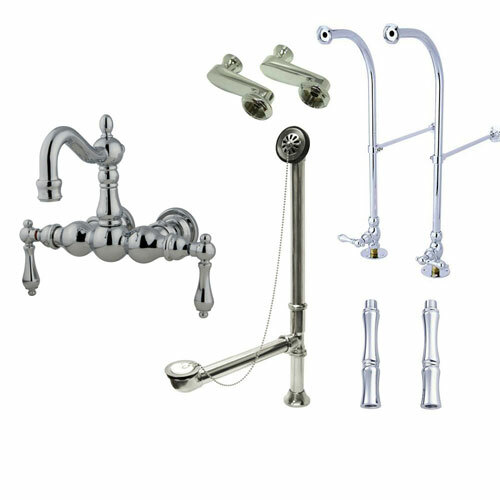 This Floor Mount Freestanding Tub Filler Faucet Package Kit includes the Faucet, Supply Lines, Tub Drain, and all other required hardware. All fixtures come in matching Chrome Finish. Note that although there may seem to be variations in the finish as it appears in the product photos, in reality all components of this package will match each other perfectly. This difference is caused by lighting and photography issues and NOT by differences in the finish of the products themselves. Using our 40+ years experience in the plumbing industry we have put together these packages to simplify the buying process. View the sample installation images to get a better idea of how this will look once installed. Notice how the Free Standing Supply Lines have wall supports. These can be attached either to the wall directly or to the tub drain itself using the included drain braces. These ensure that this product will stand strong and sturdy. Based on the position of your tub, you can choose the ideal set-up and decide where and how to attach the supports. This Floor Mount Freestanding Tub Filler can be installed either at the end of your Tub or in the center of the Tub. The installation of this package is designed to be flexible so it can work with virtually any Tub in any space. This package comes with a great looking Clawfoot Tub Filler Faucet. It also includes Rigid Freestanding Floor Mounted Supply Lines with Supply Stops that match the style of the Faucet handles. It comes with Supply Line Risers to make sure the Faucet can get up and over the rim of even the tallest Tub. This package has matching finish Wall Supports and Drain Braces for anchoring and added stability. It also includes Swing Arms so you have some flexibility with how far apart you can set the Hot and Cold Supply Lines when installing the Faucet. Furthermore, this package includes the matching finish Clawfoot Tub Drain to complete the entire design. Our goal here at Faucetlist.com is to make buying Freestanding Tub Hardware easy. Purchase this Freestanding Tub Filler Faucet today and save BIG! Kingston Brass Free Standing Clawfoot Tub Fixtures represent cutting edge precision design and incredible prices. Get an amazing product at an amazingly low price! Don't wait, order yours now!